They’re rarely seen or heard, but the statistics on the population’s health, education, and happiness speak loud and clear. Rose Gibbs is tough. Behind a youthful face and crystal-clear brown eyes resides a person hardened beyond her years. She’s been in foster care for the past five, citing her mother’s alcoholism as the reason she and six of her siblings landed there. 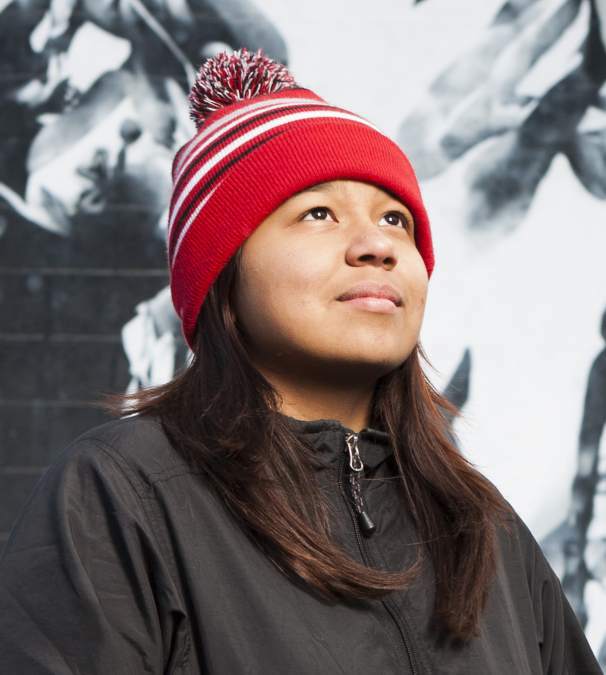 At 15, she wears a San Francisco 49ers beanie and a look of unease when talking to a reporter. She says she “had to grow up too fast,” and it’s hard not to agree with her. Rose, who identifies as both Latina and a member of the First Nations Lyackson Tribe, is currently attending Ingraham High School in north Seattle. In the course of her life, including stints in Canada, Rose says she’s gone to “more than 10, maybe 20” schools. She thinks seven of those have been in the Seattle School District, but she’s not sure. It’s an understated and understandable answer from a girl who seems accustomed to hiding vulnerability with aloof, indifferent distance. But it doesn’t take much to push past Rose’s hardened front. “It happened in fourth grade,” she says of the moment alcohol and domestic violence collided, altering her life’s trajectory in an instant. Rose rarely sees her mom these days, she says after a wrenching pause. Since then she’s spent time with five foster families, but hasn’t felt at home with any of them. She’s stubborn, she admits, and looks forward to her last two years “in the system.” She says she misses her siblings, and hopes one day to reunite with them. Rose started coming to the Urban Native Education Alliance’s Clear Sky Native Youth Council, where I met her, back in April. At this point she’s what UNEA Chair Sarah Sense-Wilson describes as a “regular,” with an “indomitable spirit” —and a good example of exactly the kind of local kid the nonprofit tries to reach. Through Clear Sky, the UNEA offers tutoring, art, a sense of cultural belonging, and—perhaps most anticipated—a solid meal to urban Native American kids who need it. As it turns out, plenty in the Seattle area do. Rose and I are seated at a round table inside the Seattle School District’s Wilson-Pacific Building. Compared to my previous visit to Clear Sky, where I’d first met Rose three weeks ago, things are considerably more comfortable. There’s heat this time. And bathrooms that work. On my first visit, the urban Native kids who come to Clear Sky gathered in a cafeteria toward the back of the soon-to-be-razed school building. The missing tiles from the ceiling and floor, and the sign on the door reading “RESTROOMS CLOSED/NO WATER” gave the gym an air of abandonment. But tonight’s different. The meeting has been moved to a new room, and the upgrade is palpable. UNEA Co-Chair Mary Ann Peltier, who is from the Chippewa, Assiniboine and Sioux tribes, spills the details: They struck a deal with the school district, agreeing to pay $18.35 a night for the improved amenities. A bad building wasn’t keeping Clear Sky from working its magic, however. While jackets were sometimes required, the decrepit, mural-covered cafeteria at the back of the Wilson-Pacific building was enough for Peltier and Sense-Wilson, a straight-shooting member of the Oglala Sioux tribe, to roll up their sleeves and get to work in. The UNEA’s flagship program, Cleark Sky held its first meeting in 2009, and they’ve been at it every week since. Sense-Wilson smiles as she ribs me. The room is abuzz. 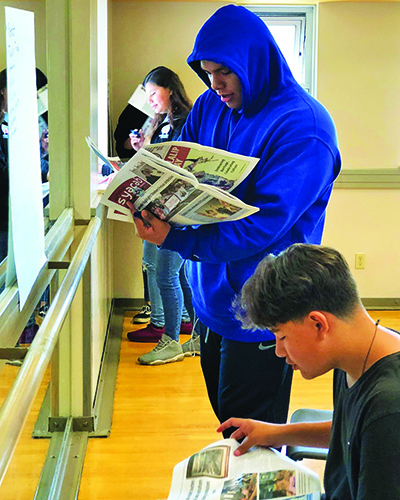 Subway sandwiches are on the menu, along with a class called “‘Native Journalism 21st Century.” The Clear Sky mission of promoting “cultural, traditional activities and educational achievement” is alive around us. Though the UNEA also offers a basketball program and various other special events geared toward the urban Native population, the Clear Sky Youth council is the nonprofit’s gem. Sense-Wilson says the program provides academic support for “ensuring the success of Native learners,” and boasts a 100 percent high-school graduation rate. Outside the walls, however, things get difficult for young urban Natives like Rose, who live off the reservation, a minority among minorities in the city. According to census data, only .8 percent of Seattle identifies as American Indian or Alaska Native alone—a mere blip in a city named after Chief Sealth which was home to Native peoples thousands of years before a white person ever set foot here. It’s a demographic that faces a daunting set of challenges. It can be lonely, and worse. And it isn’t getting better. 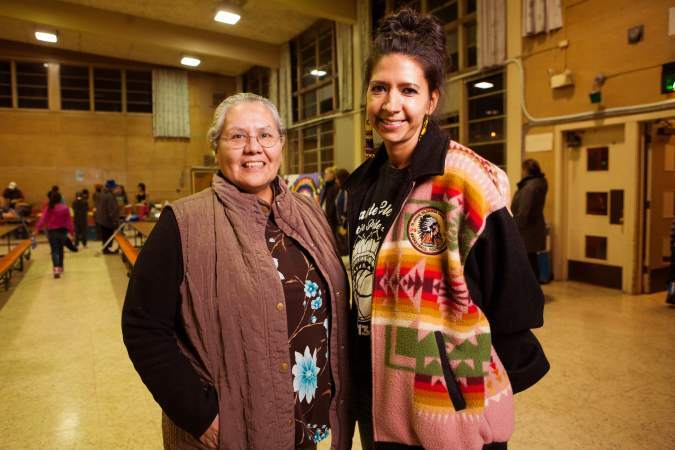 According to information presented in the Seattle’s Race and Social Justice Initiative three-year plan for 2012 to 2014, American Community Surveys over the last 20 years show that the poverty rate for Natives in Seattle has fluctuated, but only slightly. In 1990, 33 percent of Natives lived in poverty; in 2000, it was 29 percent; by 2009, it was back up to 30 percent. That’s higher than the poverty rate for any other ethnic group. Meanwhile, the poverty rate for white Seattleites has stayed steady at just 9 percent. For urban Native kids, the stats can look even worse. According to the “Community Health Profile” for the Seattle Indian Health Board released in December 2011, in King County 46.6 percent of American Indian and Alaska Native children under age 6 lived below the poverty line between 2005 and 2009, compared to 13.2 percent of children in the general population. The difficulties only continue from there, and for a population as small, diverse, and historically maligned as this one, even finding a starting point from which to dig out can seem daunting. They include the pronounced education achievement gap between Native students and whites, resulting in historically low graduation rates and high dropout rates for American Indian and Native Alaskan students; numerous health concerns, from asthma to diabetes and obesity; addiction and alcoholism; domestic violence; a disproportionate rate of homelessness; and institutional neglect. And the fact that Natives, 1.5 percent of the overall population, make up 4.4 percent of Washington’s prison population. There’s also the simple fact that placing an umbrella ethnic classification like “Native American” over a group of city-dwelling people from hundreds of tribes and countless cultural traditions simply doesn’t accurately define it. As a result, the population often fades into the firmament. “Sometimes I don’t think they see us,” Rose says. It’s a common sentiment. Changing people’s fortunes—as Clear Sky aims to do—often begins with confronting this sense of aloneness, pounded into Seattle’s Natives by politics, policy, perceptions, and nearly 200 years of history. “To not have any representation that reflects who you are, or honors your cultural, your tradition, your history, it’s really a profound psychological, oppressive place to be,” Sense-Wilson says. Clear Sky is a bright spot. Looking around on this Tuesday night, there is hope to be had. There’s Rose and her improved grades and self-worth. There are the other 40 or so kids who have arrived, each equally important. There are Sense-Wilson, Peltier, and the other adult volunteers, filling a need for their community when no one else did. And there are smiles. You get the feeling that if the uncertain future of Seattle’s urban Native community is to be bright, it will likely start with exactly the kind of thing happening here. Mary Ann Peltier, left, and Sarah Sense-Wilson help run Clear Sky Youth Council meetings every Tuesday and Thursday in the Wilson-Pacific Building. Call it a starting point. With only the very occasional yawn, the seven lawmakers who make up the committee have come together this Friday afternoon to learn about the plight of urban Native Americans. For the elected policy-makers, it’s a chance to learn. For those invited to teach them, it’s a chance to have a voice in the halls of power. Ralph Forquera, a member of the Juaneño Band of California Mission Indians and the executive director of the Seattle Indian Health Board, is first up. The semicircle of seated decision-makers listens as he gets into specifics, trying his best to describe the 29 federally recognized tribes and six unrecognized ones that meld together, along with countless individual Native transplants from across the continent, to make up our state’s remarkably diverse urban Native population. (Nationally, there are 566 federally recognized tribes and hundreds of unrecognized ones.) It’s no easy task, which is part of the larger problem. The population is mixed, with varying ties to local, national, Canadian, and Alaska Native tribes, Forquera tells them. Some, like the 4,809 Seattle residents who identified as American Indian or Alaska Native alone in 2010, show up on the census. Many more don’t, for reasons both simple and complex. Who is an American Indian these days, and who marks the box when asked? “It’s a very difficult question to answer,” Mark Trahant, a former editor of the Seattle Post-Intelligencer editorial page and current Atwood Chair of Journalism at the University of Alaska Anchorage, tells Seattle Weekly. Trahant, a member of the Shoshone-Bannock tribes and the former president of the Native American Journalists Association, has written extensively on the lack of clear data on the Native population. Some Natives have long hesitated to identify themselves for statistical purposes, Trahant says by phone from his office in Alaska. Others have unclear or mixed ethnic identities. How much of a connection must one have to identify as Native? What’s required by the tribe? Different ones have different standards, Trahant notes. And what about the growing generations of urban Natives off the reservations? How can we accurately account for them? None of these questions have easy answers, he says. But some of the numbers are indicative enough, and Forquera confronts the harsh realities every day. Leading the Seattle Indian Health Board and the Urban Indian Health Institute, he knows the “Community Health Profile” delivered in 2011 states that Natives in King County die of “unintentional injuries” (that is, accidents) more than twice as often as anyone else, at a rate of 79.3 per 100,000 deaths (compared to 32.4 per 100,000 among the general population). They suffer from asthma more than twice as often (17.3 percent vs. 8.1 percent), and diabetes too (12.2 percent vs. 5.9 percent). They’re nearly twice as likely to be obese as the general population (36.3 percent vs. 20.1 percent). The list goes on, and Forquera knows all of it well. While his expertise is in health, this afternoon Forquera is also a history teacher. In his allotted 10 minutes, he does his best to deliver CliffsNotes on the past 160 years, providing a basis for what’s seen on the ground today. Natives inarguably have been a part of Seattle’s identity since the Denny Party’s arrival at Alki in 1851—and, of course, were the area’s identity for thousands of years before white men tied their boats to Puget Sound shores and pushed them to the side. In Washington, as of the 2010 census, 74 percent of those identifying as American Indians or Alaska Natives lived in cities, up from 71 percent in 2000. Statewide, the population of urban Natives is growing. According to data provided by Leslie E. Phillips, Ph.D., the scientific director at the Urban Indian Health Institute, from 2000 to 2010 Washington’s American Indian/Alaska Native population increased 30 percent, from 113,625 to 147,371. The national move toward reservations goes back even further, to a series Indians Appropriation Acts that started in 1851 and formalized the process of relocating Natives to land set aside for them by the U.S. Government. As Trahant notes in a recent research paper, however, many of the country’s earliest Native American policies have been based on the conquering view that American Indians would one day be extinct. “The assumption had come down from the earliest of times, not always voiced, but implicit, that the native inhabitants of the New World would become extinct. The notion grew stronger as the settlers waxed in numbers and the demand for living room accelerated,” D’Arcy McNickle, a member of the Confederate Salish and Kootenai tribes, wrote in his 1973 book, Native American Tribalism. The extinction never materialized. Today, according to numbers from the United States Bureau of Indian Affairs, approximately 56.2 million acres are held in trust for Indian tribes and individuals, and there are approximately 326 Indian land areas in the U.S. The most recent numbers from the BIA indicates nearly two million enrolled tribal members. Though local and federal government has done its part to drive Natives from Seattle, it’s also worked to bring them back to the city—for better or worse. A swell created by the federal assimilation policies in the 1940s, ’50s and ’60s—like House Concurrent Resolution 108, for example, which officially terminated the federal government’s acknowledgement of tribes from New York to California—pumped Natives into cities. The idea—or the stated one—was to free Native Americans of federal supervision and provide them with the same opportunities as other citizens. On at least one Friday afternoon in Olympia this session, that wasn’t the case. “Be assured, we’re not just going to let this drop by the side,” Community Development, Housing and Tribal Affairs Chair Sherry Appleton (D-Poulsbo) says for the official record, before closing the meeting. So far during the 2013 and 2014 sessions in Olympia, 40 bills relating to Native issues have been dropped; four have been passed by both chambers and signed by the governor. As Rose will tell you, the invisibility felt by Natives in the general population shows up in Seattle’s schools. But according to those who’ve been around far longer than she has, this wasn’t always the case. The District’s Indian Heritage High School, which for years found a home in the very same Wilson-Pacific building where Clear Sky now reserves a room on Tuesday and Thursday nights, was created in 1974. By the mid-’90s, the late Principal Bob Eaglestaff, a Lakota from the Cheyenne River Sioux reservation, was credited for turning the program into a national model for urban Native American education. The innovative school, which provided public education to Native students embracing cultural identity and Native American history, sought—with impressive success—to combat low graduation rates among Native students. District spokesperson Teresa Wippel points to the Seattle Public Schools history books when describing Indian Heritage, noting the 100 percent graduation rate it achieved by 1994. Back at Clear Sky, the Seattle School District’s attempts to serve its Native population directly impact the 15-year-old sitting across from me. And with a few sharp—and obvious—exceptions, the challenges in Rose Gibbs’ life aren’t all that different from those of the children who surround us at the Clear Sky Youth Council, now beginning to line up for dinner. A U.S. Department of Justice Indian Education grant application for the 2013–14 school year provided by the District depicts American Indian students well behind in mathematics, reading, and science. WASL scores in reading and mathematics for American Indian students are also the lowest of any ethnicity. Statewide, a 2008 report from the state Superintendent of Public Instruction’s Office detailed the achievement gap between white students and Native Americans, showing Native fourth-grade boys and girls behind white students in National Assessment of Educational Progress (NAEP) math and reading scores, among other deficiencies. In King County, the Seattle Indian Health Board “Community Health Profile” released in Dec. 2011 indicates that 18.3 percent of those 25 and older who identified as Native American or Alaska Natives reported not having finished high school or obtained a GED—a rate more than twice that of the general population. But how? That depends on who’s answering. 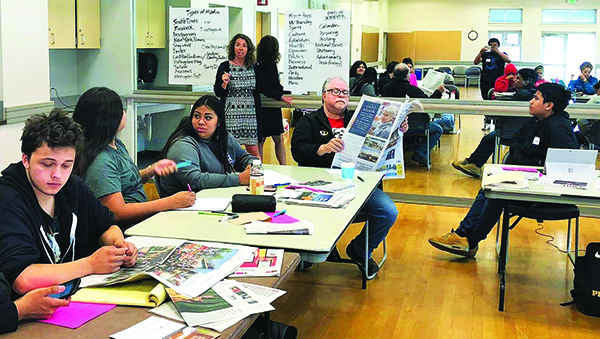 Many in the Native community call for more Native-specific curricula, more cultural inclusion, Native language courses, and—primarily—a return of the District’s Indian Heritage High School. This last would be a decision for the School Board, Wippel says. For Native students, according to Shauna Heath, the executive director for curriculum and instruction for Seattle Public Schools, this plan includes targeting resources; utilizing federal grant funding; working to place a liaison for Native students in every school; implementing a Washington Tribal Sovereignty curriculum (which has already started in West Seattle and will continue in 2014–15); and connecting students with Native professionals and role models. The District also hired Gail Morris as its new Native American Services Manager in October. From the Ahousaht First Nation, and locally having adopted the Muckleshoot tribe, Morris’ job, among other things, is to help ensure that as many Native students as possible qualify for Title III and Title VII federal education funding. Historically, this has been an area of struggle for the District, with funding having been lost in the past and auditors on four occasions finding that Seattle Schools overrepresented the number of Native students who meet these requirements. District-wide, another area of concern has been Seattle’s special-education program, which hits Native students particularly hard. A December 4, 2013 “Native American Education Board Update” from the district indicates that 29.9 percent of Native students are identified as qualifying for special education—the highest percentage of any demographic in the district. Many of these Native families have voiced complaints. Especially troubling, says Deborah Sioux Cano-Lee, board president of the nonprofit Washington Indian Civil Rights Commission, are reports from Native families that their special-education students aren’t receiving the support that their student learning plans require under federal law. Sioux Cano-Lee says her agency has received at least 16 such complaints, and they’re being investigated. Unfortunately, this is hardly the first time the Seattle Public Schools’ Special Education department has faced such scrutiny. The state Office of Superintendent of Public Instruction has chastised the program, even threatening to withhold federal funding, ordering problems (the failure to update and administer student learning plans and provide consistent special-education services from school to school) to be fixed. “I’m from Seattle. I grew up here,” she explains. “I went to Seattle public schools, so I know that experience of going to school day in and day out and not being able to relate in the same way, and that constant pressure of conforming and not having your identity honored or recognized.” Rose breaks it down in far simpler terms. “Since we have the lowest scores, no one really cares,” she says, making it apparent that despite the district’s recent efforts, work remains. “There’s not much to say, not much to tell,” Rose surmises. There are places to turn for young Natives in Seattle. In addition to organizations like the Urban Native Education Alliance, the Clear Sky Youth Council, the Daybreak Star Indian Cultural Center and the Red Eagle Soaring Native youth theater group, nonprofits like Longhouse Media exist—at least in part—to help create a Native community within the city. Created in 2005 and currently run from a small office in the back of the Northwest Film Forum building on Capitol Hill, Longhouse was developed to “nurture the expression and development of Native artists,” according to Executive Director Tracy Rector. A 42-year-old who identifies as Choctaw, Seminole, African-American, French, Irish, Scottish, and Hungarian, Rector grew up in Seattle and says many of the stories her 9-year-old Native-run nonprofit helps to tell “specialize in the urban native experience.” Since 2005, Rector says, Longhouse Media has helped make more than 360 short films and worked with 2,200 students—all of them young, all of them Native. She says over 80 percent live at or below the poverty line. If Seattle’s history is Native history, then the city’s future is tied to the struggling urban Natives who call it home. As long as the city’s first peoples suffer, we suffer as a city. And for every kid at the Clear Sky Youth Council on this Tuesday night, the future is of direct consequence. For Rose Gibbs, plotting a successful course into that future isn’t about census numbers, statistics, or trends. It’s about finding a way to pass English and science and finish the 10th grade at Ingraham. It’s about graduating from high school and, she hopes, making it to college—something Rose wants, but isn’t sure will be possible. Talking about the future elicits an equal mix of defiant self-confidence and uncertainty. She’ll be fine, she promises. She’s just not sure how. One thing Rose is certain about, however, is that Clear Sky has helped. It speaks to the power of a grassroots movement and the importance of an invested community. It speaks to what people can do, even when it feels as if 98 percent of the population doesn’t see them; to resiliency and hope; to the promise of tomorrow, for Rose and others. With that, she gets up and joins her friends. At this moment, in this warm room with working bathrooms, filled with people who care, Rose is anything but invisible. 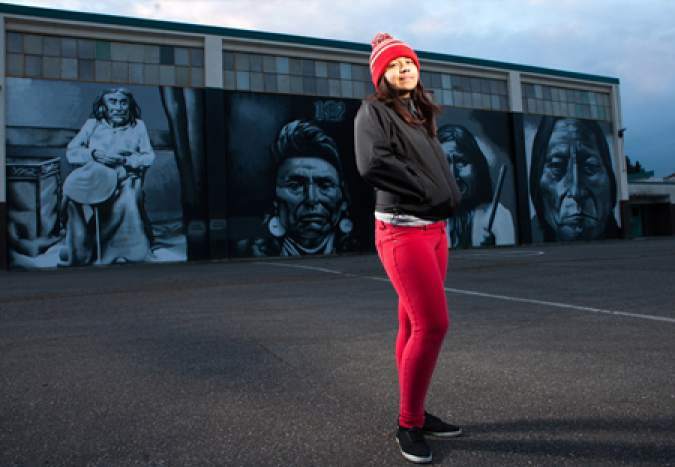 Outside the walls, however, things get difficult for young urban Natives like Rose, who live off the reservation, a minority among minorities in the city. According to census data, only .8 percent of Seattle identifies as an American Indian and Alaska Native alone —a mere blip in a city named after Chief Sealth which was home to Native peoples thousands of years before a white person ever set foot here. It’s a demographic that faces a daunting set of challenges.